In East Chicago, Indiana, lead is seemingly everywhere: in the soil, in the water, even in the dust in people’s homes. That’s because the community is sitting within the USS Lead Superfund site. Nearby, companies used to spew lead and arsenic into the air up until 1985. Now, 38 households in the Calumet neighborhood are suing the companies responsible on counts of negligence, private nuisance, trespass, and negligent infliction of emotional distress. They filed the lawsuit, Alvarez et al v. Atlantic Richfield Company et al, on October 31 in the U.S. District Court Northern District of Indiana, with the help of a pro bono attorney. It wasn’t until 2016 that authorities took direct action to protect the health of city residents—who are primarily black and Latino and 36 percent in poverty. East Chicago Mayor Anthony Copeland announced, then, that the 1,100 residents of the city’s West Calumet Housing Complex should “temporarily relocate” to “safer conditions” after test results revealed the extent of the contamination. Homeowners are asking the court to order compensatory and punitive damages in light of the impact this contamination has had on both their properties and emotional well-being. They want $75,000 each. The combination of contamination, inaction, and failure to inform has created widespread anxiety among the residents who own homes at the Superfund Site, including Plaintiffs. Their property values have plummeted, and they cannot sell their homes. Worse, they constantly worry about the health and safety of themselves and their families. They no longer let their children play outside or let their grandchildren visit, and they are left to wonder whether the high incidents of respiratory issues, kidney disorders, cancer, asthma, and learning disabilities that occur frequently in their community were caused by lead and arsenic poisoning or other contaminants endemic to the Superfund Site. This action has been a long time coming. The EPA recommended the 79 acres of land be added to the Superfund National Priorities List back in 1992, but it didn’t make it on the list until 2009. 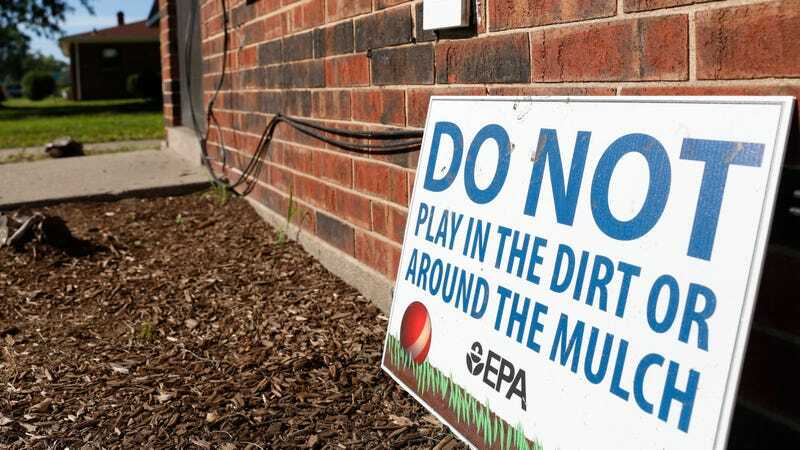 Even then, nothing really happened until 2014, when widespread cleanup and testing efforts began in the West Calumet Housing Complex, whose soil was impacted by the facility’s pollution. Authorities found that lead levels in some yards exceeded 45,000 parts per million, as the EPA documents in test results published in 2016. The federal limit is 400 parts per million where children play and 1,200 parts elsewhere in yards. Many homes throughout the region saw their drinking water with lead amounts that exceeded the action level of 15 parts per million, although no amount of lead is safe for children. That’s when things got real for folks in the neighborhood—and when mobilizations began. By June 2017, the final residents at the public housing complex left. This lawsuit isn’t the first of its kind. In 2016, more than 250 individuals in East Chicago filed a similar complaint against the same companies in this new case: Atlantic Richfield Company, DuPont, and The Chemours Company, among others. Another suit has gone after the government officials responsible. Defendants in this recent lawsuit, like the Atlantic Richfield Company and E.I. Du Pont de Nemours and Co., entered into a $26 million settlement with the EPA to help pay toward cleanup in 2014, but residents want more. Now, they’re demanding it in court. Earther has reached out to the attorneys on the case for comment on what comes next, and we will update this post if and when we hear back.